Lawrence Kent is originally from Ho-Ho-Kus, New Jersey but now lives in Seattle with his wife, three kids, and about 25 tanks, many filled with cichlids he collected in the wild. An economist by training, Lawrence works for a charitable foundation striving to help the poor in Africa and South Asia to lift themselves out of poverty by improving their agricultural productivity. He travels widely and frequently for his work and has lived abroad for ten years in Mauritania, Burkina Faso, Chad, Madagascar, and Egypt. 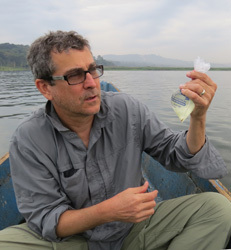 Lawrence is fascinated by African cichlids and has published on his “fish watching” adventures in Mozambique, Zambia, Kenya, Tanzania, Nigeria, Rwanda, Burkina Faso, Uganda, and the Congo. He also loves bird watching, reptiles, and even mormyrids and killifish! Our speaker has offered to go on a local collecting trip for daces and darters! Either Saturday (4/14) or Sunday (4/15) morning! Anyone who wants to go please respond here or PM me and I will pass along your contact info to Mr. Kent. Sounds like fun!!! The question is will the weather be spring or winter? Oh my gosh, please Sunday - Sunday, Sunday, Sunday!!!! Do you know where he's looking to go? I have dog training Saturday mornings. Unfortunately, I won't be able to make the meet. I saw Lawrence Kent present at the Keystone Clash. He is very engaging. Collecting can happen whenever you want it to! I’ll check with him and get back to you all. Sunday works for Lawrence! Anyone else want to go? I have reached out to Bob Bock as he would know where to go. Lawrence is from Seattle and isn't sure where to go. If you have ideas feel free to speak up. Will there be an auction? There's no CCA entries at www.mygroupauctions.com. JLW might be able to help in that regard. There is always FishMap.org, which I think is somehow connected to NANFA. You can put in the species of interest and see where it has been collected previously. Unfortunately a lot of the dates are quite a long time ago and I expect possibly better places exist but just aren't recorded. So if anyone has current local knowledge that would be best. But the map does show Greenside darter have been collected in Cabin John Creek in 2010 right where it goes under the beltway, as well as further down (1995) and upstream (2008). Overall a smaller waterway would be my preference, given how cold the water will still be.... brrrrr. It looks like at least one other type of darter and 2 types of dace were found there as well. Agreed. I don't have waders or even boots. There's Little Bennett creek and the waterways around Point of Rocks, too, but I have no idea if there are any reports of specific fish found in those places. 1) The cold. Even though we're getting warm days, the water will probably be too cold to enter without waders. Water that's below 50F will get to you after awhile. Trust me. 2) Technically speaking, Maryland requires a scientific collection permit in area waterways. We likely wouldn't get it in time for the weekend, even if I apply today. 3) No colorful darters around here. Just dull earth tone darters. 1) A microfishing trip to Pennyfield Lock on the C&O. Fairly short travel time, and it has a really colorful small sunfish species, Lepomis megalotis peltastes. Plus, if you fish in the riffles below the spillway, there are usually some interesting cyprinids: spotfin shiners, and creek chubs. What would help is if there are any trout fishermen who could tie leaders on size 22 hooks, so there are enough to go around. I have some worm flavor Berkely Gulp left over from last season, which the smaller fish seem to like. 2) Go to Virginia. I would need to find a small stream close by, so as not to eat up too much time traveling. I'll ask Derek W. for a recommendation. Yes, there will be an auction. I updated the CCA entries. Sellers will probably start entering items later in the week. I cannot attend the collecting trip on Sunday. I have a pair of hunting (non-insulated) waders and a pair of (insulated) hip waders. I think they are both mens size 11. I can bring them to the meeting on Saturday. But really, 50 degrees isn't that cold. If it gets up to 50. Do we have a time frame for Sunday? What time does his plane leave?